Middle School Service Plunge 2015 - What a GREAT week! 2014 Middle School Service Plunge is in the books! It was another great year of worshiping, learning and SERVING together - and a whole bunch of fun! Dates have not yet been set for Service Plunge 2015, but chances are good it will be July 6th-10th. Or not. Information will be out in plenty of time for you to sign up! Enjoy the video with photos from the 2014 Service Plunge, and some from CtK's 2014 VBS - Family Art Nights: Celebrating God's Creation! Each year, students entering grades 6-9 gather together for a week of service in the Gallatin Valley. 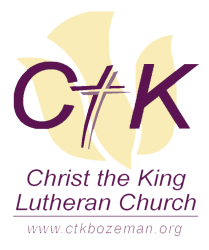 The Service Plunge is a cooperative ministry of Christ the King Lutheran Church, Hope Lutheran Church and First Presbyterian Church. 12:00pm - This year (2014) we'll walk from our last service site to Bogert Park, for a picnic lunch and time in the pool!